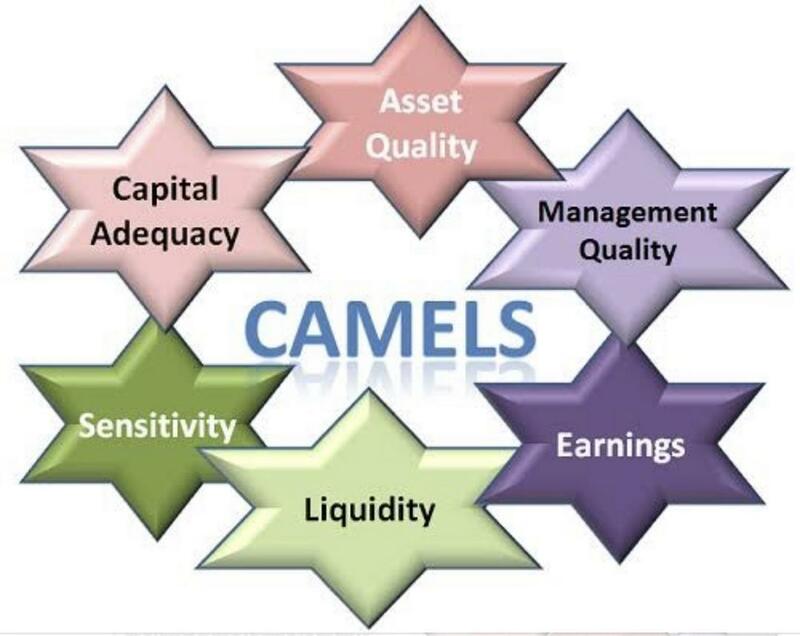 CAMELS is a recognized international rating system that bank supervisory authorities use in order to rate financial institutions according to six factors represented by its acronym. Supervisory authorities assign each bank a score on a scale. A rating of one is considered the best, and a rating of five is considered the worst for each factor. Banks that are given an average score of less than two are considered to be high-quality institutions. Banks with scores greater than three are considered to be less-than-satisfactory institutions. Examiners assess institutions' capital adequacy through capital trend analysis. Examiners also check if institutions comply with regulations pertaining to risk-based net worth requirement. To get a high capital adequacy rating, institutions must also comply with interest and dividend rules and practices. Other factors involved in rating and assessing an institution's capital adequacy are its growth plans, economic environment, ability to control risk, and loan and investment concentrations. Asset quality covers an institutional loan's quality, which reflects the earnings of the institution. Assessing asset quality involves rating investment risk factors that the company may face and comparing them with the company's capital earnings. This shows the stability of the company when faced with particular risks. Examiners also check how companies are affected by the fair market value of investments when mirrored with the company's book value of investments. Lastly, asset quality is reflected by the efficiency of an institution's investment policies and practices. Management assessment determines whether an institution is able to properly react to financial stress. This component rating is reflected by the management's capability to point out, measure, look after and control risks of the institution's daily activities. It covers management's ability to ensure the safe operation of the institution as they comply with the necessary and applicable internal and external regulations. An institution's ability to create appropriate returns to be able to expand, retain competitiveness, and add capital is a key factor in rating its continued viability. Examiners determine this by assessing the company's growth, stability, valuation allowances, net interest margin, net worth level and the quality of the company's existing assets. To assess a company's liquidity, examiners look at interest rate risk sensitivity, availability of assets that can easily be converted to cash, dependence on short-term volatile financial resources and ALM technical competence. Sensitivity covers how particular risk exposures can affect institutions. Examiners assess an institution's sensitivity to market risk by monitoring the management of credit concentrations. In this way, examiners are able to see how lending to specific industries affects an institution. These loans include agricultural lending, medical lending, credit card lending and energy sector lending. Exposure to foreign exchange, commodities, equities and derivatives are also included in rating the sensitivity of a company to market risk.